Question-Answer Ball Promotes Healthy Habits! Mind-sharpening, plus it encourages socializing and fitness fun! Help stem the tide of poor nutrition. Better foods equal increased metabolism and energy! Features questions like "Your body uses protein for energy. T or F?" Eating processed and refined food that has lost its nutritional value can cause reduced metabolism and lack of energy, among other things. 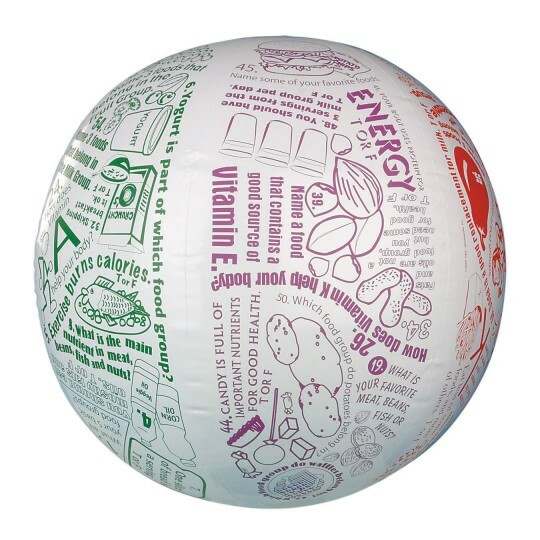 This mind-sharpening question-answer ball encourages better eating habits, social interaction and physical fitness fun! Features questions like "Your body uses protein for energy. T or F?" and "What is the main nutrient in meat, beans, fish and nuts?" 24". Game and activity ideas included. This is such a fun way to get the class up and moving while learning.